Understand Want to know more? 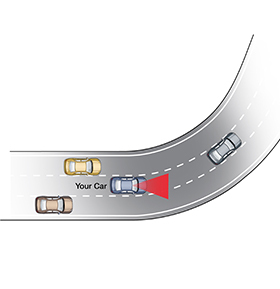 Deepen your understanding of Lane Departure Warning. Challenge Up for a challenge? 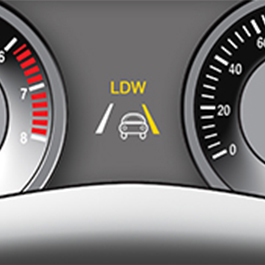 Tackle a few challenging scenarios using Lane Departure Warning. Lane departure warning is designed to help you avoid crashes due to drifting or departing your lane. The system detects lane markers and alerts you when a tire touches a lane marker. The warning is usually a flashing indicator and/or it beeps from the corresponding side. In some systems, the steering wheel or driver’s seat vibrates gently. Generally, lane departure warning systems will not alert you when your turn signal is on. 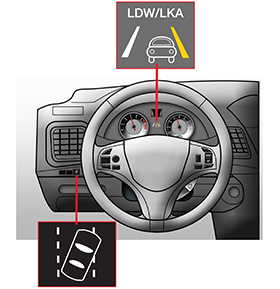 Some vehicles are equipped with lane keeping assist, which is a more advanced version of lane departure warning. If the system detects a potential lane departure and you do not respond in time, lane keeping assist will gently steer you back into the lane. Some lane departure warning/lane keeping assist systems are activated by pressing a button, while others are automatically activated when you turn on your car. This button will have an indicator light to show when the system is active. The lane departure warning system searches for lane markings when your car is on a straight or slightly curved road and your turn signals are off. When you use your turn signals or turn your steering wheel quickly, the system will not alert you. Most lane departure warning/lane keeping assist systems function best on highways, and some systems only operate at speeds over 35 mph. The lane departure system uses a camera located near the rearview mirror to recognize lane markers. To function properly, there needs to be clearly visible paint stripes on both sides of the vehicle. It will NOT recognize curbs. If the system detects that your car is too close to the left or right side lane markings, and your turn signal is not on, a warning light, a vibration, and/or sound will be activated. In addition to the camera, lane keeping assist has a steering input assist. 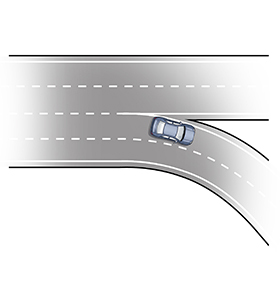 Lane keeping assist will gently turn the steering wheel to keep your vehicle between the left and right lane lines, gently steering your vehicle in the opposite direction of the lane boundary. In some systems, the tugging on your steering wheel will become stronger the closer your vehicle gets to the lane markers. 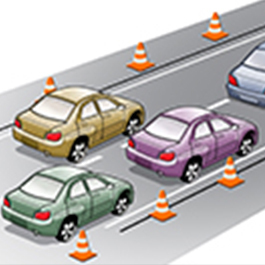 Lane departure warning systems monitor the lane markings when you are driving. If the lane markings are difficult to see or not detectable, your lane departure warning system may not recognize the lanes. In the image, the lane markings on the right side of your lane have faded. So, if your car drifts to the right out of the traffic lane, your lane departure warning system may not detect the lane markings and may not alert you. Imagine you are driving a car equipped with a lane departure warning system in the following conditions. Think about the questions below. 1. 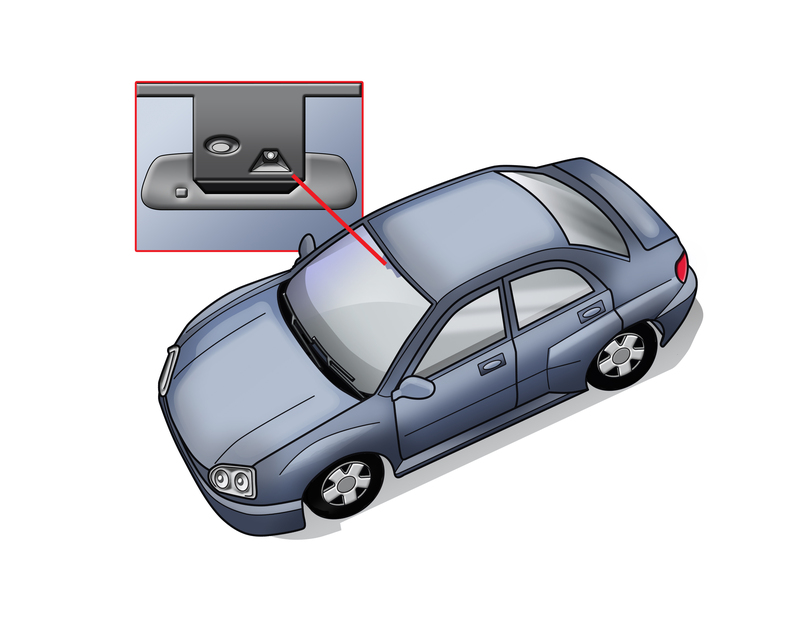 How might your lane departure warning system respond? How might my lane departure warning system respond? In the rain, when I drive on a wet road surface following another car, my lane departure warning camera may perceive the tire tracks in the water as lane lines and give me an incorrect alert. In addition, my lane departure warning system may not detect lane markings when there is any kind of moisture on the ground. Always remember, never use lane departure warning systems during bad weather. In the snow, the lane markings may be covered, so my lane departure warning system may not recognize the lines and may not alert me when my car drifts out of the lane. 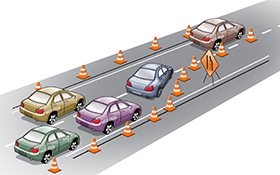 When the road is under construction, the system may not work correctly when my car is driven on a temporary lane. My lane departure warning system will still monitor the original lane markings and give me a wrong alert. In all situations, I should not rely on my lane departure warning system, and be aware of the surroundings and the traffic in my lane. Your lane departure warning system is designed for roads without sharp curves, like non-curving highways. Because the camera only looks forward, the system may have trouble detecting lane markings on curving roads. 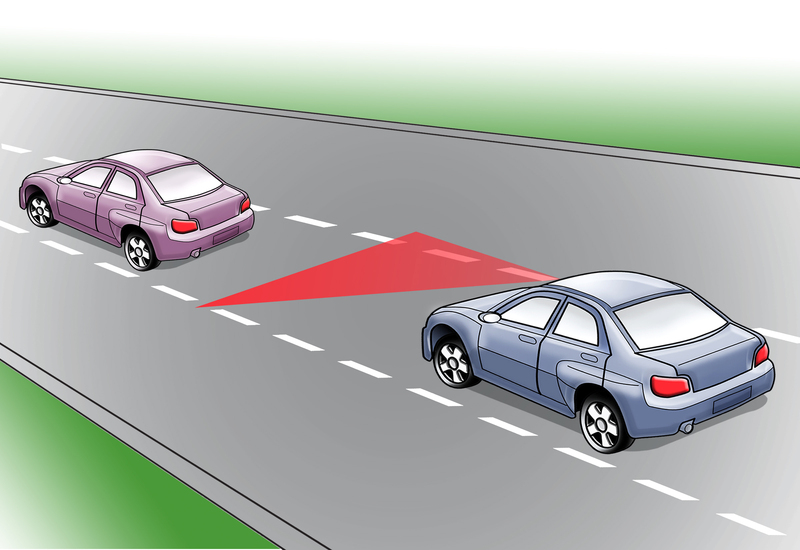 In the image below, your lane departure warning system may not recognize the lane markings on the left near the curve. 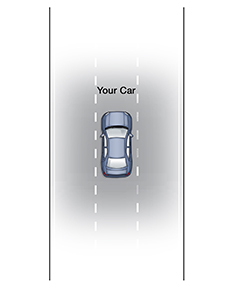 It may also incorrectly indicate that you are too close to the right even though you are in the middle of a lane. Imagine yourself driving the blue vehicle, which is equipped with lane departure warning system. Think about the questions below. My lane departure warning system may give me an unexpected alert that I am too close to the left lane (when I am driving in the middle of a lane) because it may detect the left lane marking on the curve. I should not rely on my lane departure warning system, and be aware of my surroundings and the traffic in my lane.